While it’s more useful to all you locals when I talk about upcoming events, it’s just too much damn fun talking about all the great beer I drink over the weekends. Friday started off at Naked City Taphouse trying all three Russian River IPAs (Pliny the Younger, Pliny the Elder, and Blind Pig). The Younger is the big 11% triple IPA that everyone was going crazy about before it even hit town. The six ounce sample of Younger was enjoyable, but it’s just too big to have much more than that. But, I could drink the Elder or Blind Pig all night. A surprise beer of the night was the Iron Horse Whiskey Oak Aged Belgian Black. It was just an oustanding beer. Just enough oak and whiskey sweetness to mix with the roasted malts and belgian character of the base brew. I hope to see this one come back. Saturday found me enjoying a sampler flight at Elysian in Capitol Hill for their Winter Beer Festival. My favorite of the bunch was definitely the Brett Frost, which was a completely transformed version of the original 2008 Bifrost. 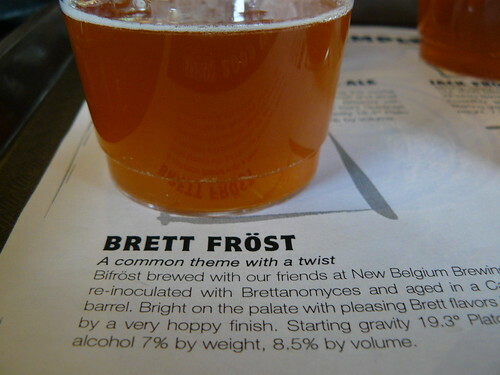 The Bifrost was thrown into a Cabernet barrel with Brettanomyces and the results were pretty freaking sweet. The Brett was very forward and the barrel added quite a bit. My favorite part of the original Bifrost, the hops, still came through in the end as well. Cheers to the Elysian/New Belgium crew for this one. What's better than browsing the selection at a great bottle shop? Doing it with a beer in your hand. Malt & Vine has a very solid list of tap beers. Next up after Elysian was a trip over to the Eastside to visit Malt & Vine. I hadn’t been to M&V since they put in their beer taps (yeah, quite a while), and I have to say I love the idea of sipping on a beer while browsing their great selection of bottles. 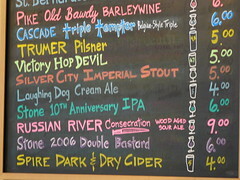 They had the new Russian River Consecration on tap, so I was a happy camper. If you haven’t had the Consecration, Naked City also tapped their keg of this Belgian Sour Ale aged with currants in oak barrels last night (Update – They are already tapped out! But, Brouwer’s is tapping a keg of it TONIGHT at 6pm; and it will go fast.). It’s fantastic – end of story. 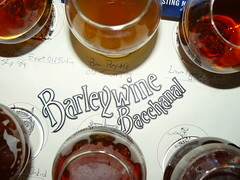 Next it was over to West Seattle for the 2nd day of the Beveridge Place Pub’s Barleywine Bacchanal. We were going to head in there on Friday night, but we really didn’t feel like dealing with the opening night crowds…and we were rewarded by going in Saturday afternoon to a relaxed atmosphere, and none of the original lineup of barleywines had run out yet. Sweet. I stuck to one flight of samples, and my favorite of the bunch was the Port Townsend Oaked Barley Wine. Port Townsend’s 10.5% barley wine aged in oak barrels was incredibly smooth, with big tastes of caramel, vanilla and light oak. It’s beers like this that make barleywine dangerously drinkable. The Bear Republic Old Scoutters and Water Street Old Wookie ’06 were also standouts for me. I finished the weekend off on Sunday by attempting to cook a traditional Czech meal (knedlo-vepro-zelo), complete with some Pilsner Urquell. I’d been craving Czech food for some time now, and the meal was pretty satisfying. If you know Czech food, you’ve probably had the traditional bread dumplings (Houskove Knedliky). Well, the recipe I used sucked and the results were less than ideal….I’ll have to find a better one for next time (anyone have one? Yeah, probably not…talking to myself at this point most likely). 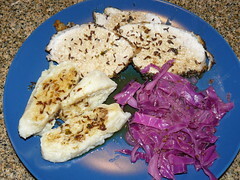 My attempt at a traditional Czech meal - roasted pork with stewed red cabbage and bread dumplings. All washed down with a Pilsner Urquell, of course. I got a chance to talk to the Naked City guy last night. He’s pretty awesome, and his tap list is really fantastic. He takes a lot of care in choosing his taps, and it shows. I enjoy Brouwer’s but it’s sure nice to walk into a place and not feel completely lost in the beer list.